Papa gives us money. Let’s us off the hook when we do something wrong. Let’s us vote and behave like kids with no consequences. Go Papa!! Socialist cultures are the death of the nuclear family. Strong, independent woman never depends on anyone. 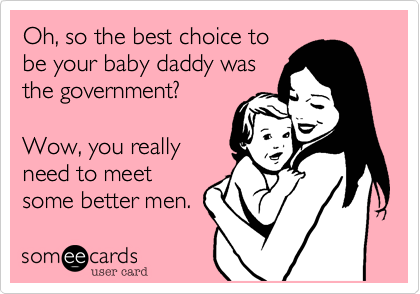 Except daddy government! Oh where’s my child support this month, I need a new hairdo!!? !